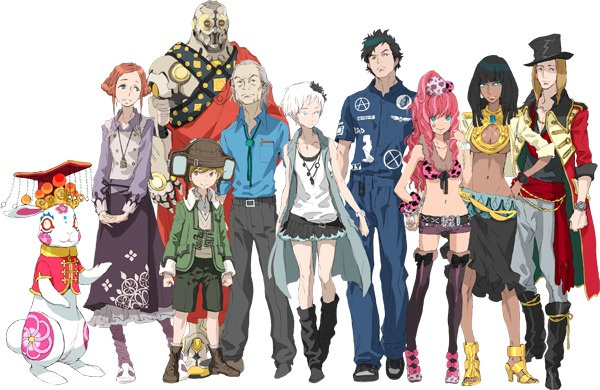 The team that brought us 999: Nine Hours, Nine Persons, Nine Doors on Nintendo DS has let a few more images escape for their latest adventure game, Extreme Escape Adventure: Good People Die, giving us a glimpse of the game's entire cast, the odd numerical bracelets they wear, and some new info on two of the game's characters. Aside from the group shot, Chunsoft released two individual images for characters Sigma and Phi. 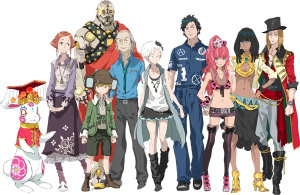 Sigma is a college student and the game's main protagonist (he's the one wearing the stylish blue jumpsuit), while Phi is the white-haired girl who, according to the developers, is prone to lying. That at least explains her premature graying. Characters in the game wear numbered bracelets, and in the image provided, you can see the word "pair" below the number nine. Does this mean characters in the game will frequently pair up and work in teams? Let us know what you think in the comments below. This is interesting to say the very lest. I shall have to keep a look out for this one. Does the rabbit have a speaking part?